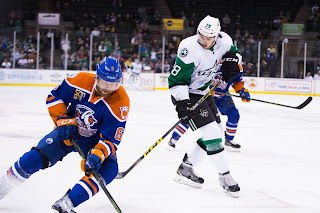 A madcap first period constituted most of the scoring in tonight's game as the Texas Stars fell to the visiting Bakersfield Condors by a 6-3 final. Despite opening the scoring, Texas found itself down 3-2 after the first period thanks to a pair of goals in the final two minutes of the period. "We knew they played fast," said Coach Laxdal. "Their speed caught our D off-guard a little bit in the first period and set the tone for the game. It was 3-2 going in after the first and we knew we could play better." Landon Bow started the game but gave up three goals on just 13 shots. He was relieved by Lagace in the second, an attempt to kick the team into gear for the middle frame. "I didn't think our backend was very hard tonight. They played light and small. We didn't have a great game there and didn't give our goaltender much help." The Stars responded to the goalie change in every way but with a goal. They earned a 5-on-3 power play, which they could not convert, and had numerous strong chances from every line. Especially notable was the play of Gemel Smith's line in the frame. "We had a solid second," said Stars' captain Travis Morin. "We locked it down defensively and limited the chances. Obviously we didn't capitalize on a few power plays that really could have changed the momentum." In the first, Texas seemingly came out on fire with Travis Morin scoring just 72 seconds in on an against-the-grain effort five hole on Gustavsson. Bakersfield answered as Griffin Reinhart tipped in a Greg Chase shot for the tie. All-Star Matej Stransky was in the right place with a paunchy rebound and managed to manipulate the puck into the net behind Gustavsson for the 2-1 lead. Patrick Russell scored the tying goal on a 2-on-1 with Dillon Simpson. 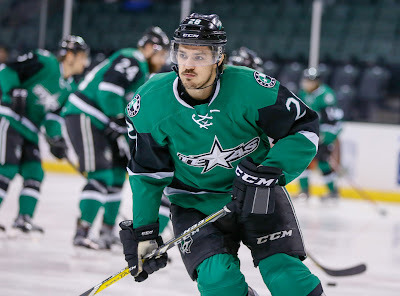 Texas looked like it would escape the period with a 2-2 score until Joey LaLeggia broke in alone after the Stars got caught trying to do too much up ice. The goal with 23.7 seconds in the first effectively ended Bow's night. While you do want to see your goaltender make those saves, you've also got to note the circumstances: odd-man rushes that put him on the back heel to begin with. The aforementioned second period found Texas on the right side of the puck in nearly every way but the way that matters: on the scoreboard. The defeating second led to a deflated third, where Texas ceded two power play goals in rapid succession to start the period. Coach Laxdal explained, "Our team is a little frustrated right now. We don't score on the power play and that frustration carries over to 5-on-5. When you get the chances 5-on-5 and you don't bury them, the frustration builds more and more. This is a growing experience for our hockey club. We have to battle adversity." Morin continued, "It's a little bit of [gripping the stick] and a little bit of puck luck, where they're not bouncing the right way." Two power play goals on "light" penalties, according to Laxdal, gave the Condors a 5-2 lead in the third. An empty net goal set the Bakersfield mark at six while Caleb Herbert scored off the assist of Branden Troock with less than ten seconds left to make it a 6-3 final. These two teams face off again tomorrow night. Jason Dickinson is injured and set at "day-to-day" according to Laxdal. They would like to rest him again tomorrow to give him a full week off, including the All-Star Break, to recoup the injury. Austin Fyten and Nick Ebert are expected back in tomorrow, and Branden Troock is expected to stay in the lineup as well. In front of a crowd of more than 12,000, the Texas Stars fell to the home team Iowa Wild to close out a quick trip to the Hawkeye State. Travis Morin scored his 12tn and 13th of the year in the game. He was the only goal scorer for the Texas side. Landon Bow stopped 39 of 42 shots. The Stars were unable to keep under their stated goal of 30 shots against or fewer. 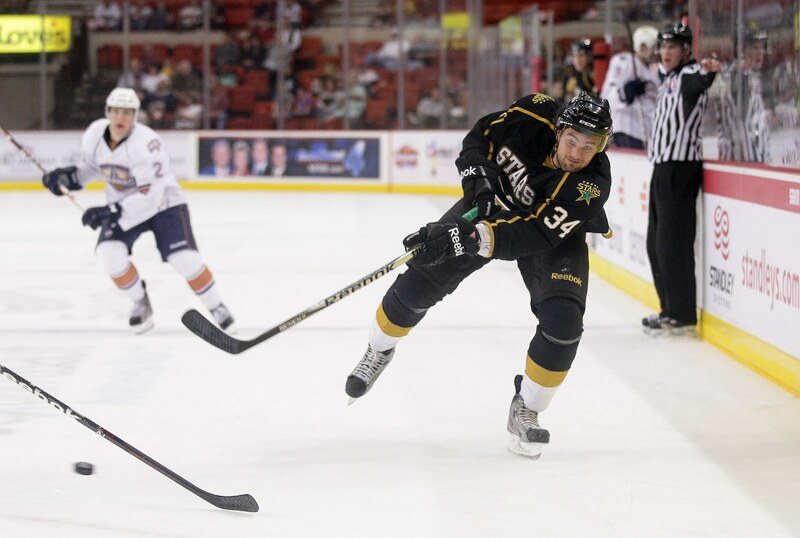 Travis Morin’s second goal of the game gave the Texas Stars a chance late, but the Iowa Wild held on for a 3-2 win on Saturday night in front of 12,547 fans in attendance at Wells Fargo Arena. The Stars (20-16-1-2) and Wild (19-19-4-1) split their weekend pair of games. Morin’s two goals gives him 149 in his AHL career. 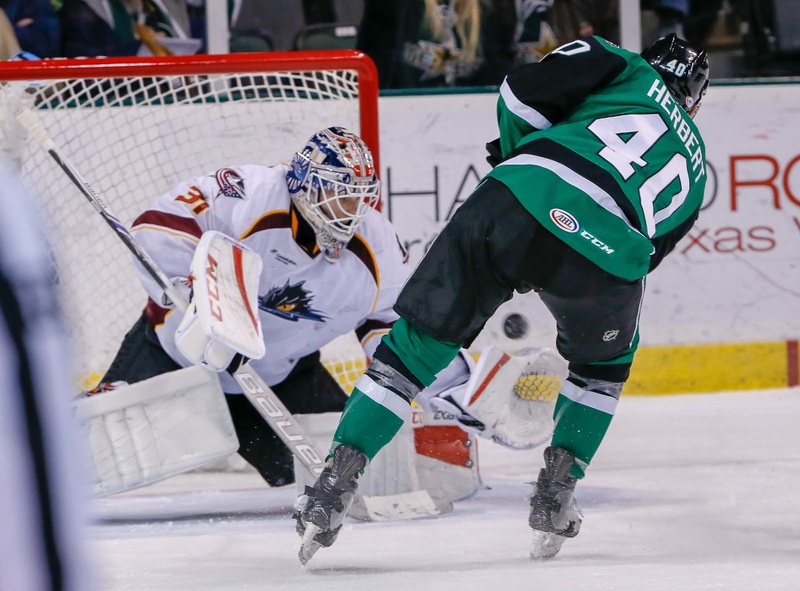 Landon Bow stopped 39 of 42 shots in net in the loss for the Stars. Steve Michalek earned the win for Iowa in a 33-save performance. 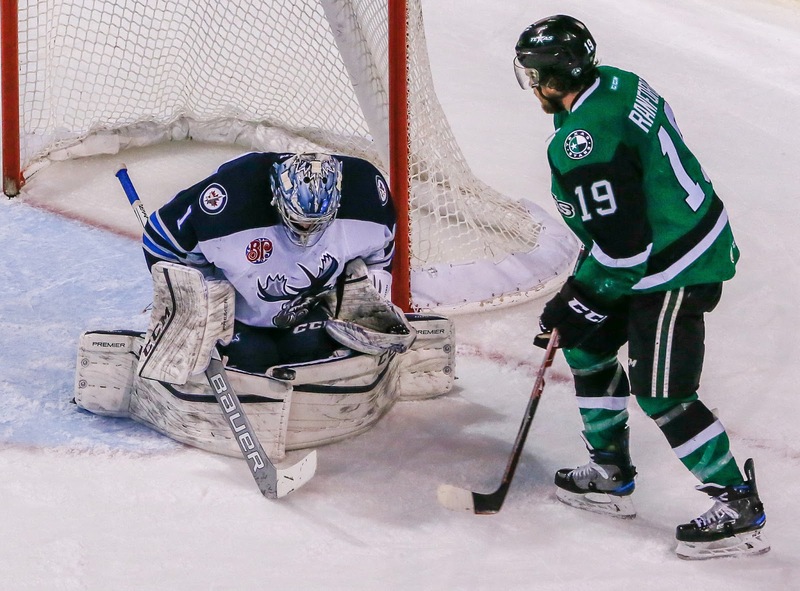 The Stars return home on Tuesday to host the Manitoba Moose at 7:30 p.m. CST. Trailing 2-1 entering the third, Iowa made it a two-goal lead with a rebound goal by Mario Lucia at 13:42. The Stars pulled Bow for the extra attacker, and a comeback push, which led to Morin’s second goal of the night with just under three minutes to play. 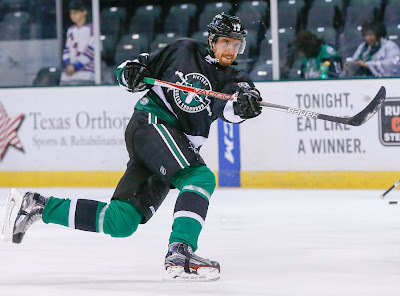 Brandon DeFazio created a rebound chance that the Stars captain batted out of the air for his 13th of the season. The Stars took a late penalty to prevent an empty-net goal by the Wild, which eliminated their opportunity at finding the equalizer. Marc Hagel’s deflection goal for Iowa midway through the first opened up the scoring on the night. Travis Morin deflected Matt Mangene’s point shot 4:48 into period two to put Texas on board, but Alex Petan tipped a shot past Bow to give Iowa the one-goal advantage again, 2-1, entering the break. Texas finished 0-for-2 on the power play. Iowa went 0-for-1. All three power play chances in the game came in the third period. There's always a response on the second night. We've documented here the well-known fact that Texas has trouble coming out of the gate in general. This is doubly true when the other team has motivation, such as losing in their home barn the night before after leading for most of the game. Texas did well to manage things last night, being down 1-0 and coming back to win. The win was Texas' second on the season when trailing after two periods (2-11-1-1). It was only Iowa's 4th loss of the season when leading after two periods (12-2-1-1). Justin Dowling did not travel with the team and will still be out tonight. It seemed like all six defensemen in last night performed well, so Brandon Anselmini would only come in as a change of pace. However, if you're winning, why change the pace? 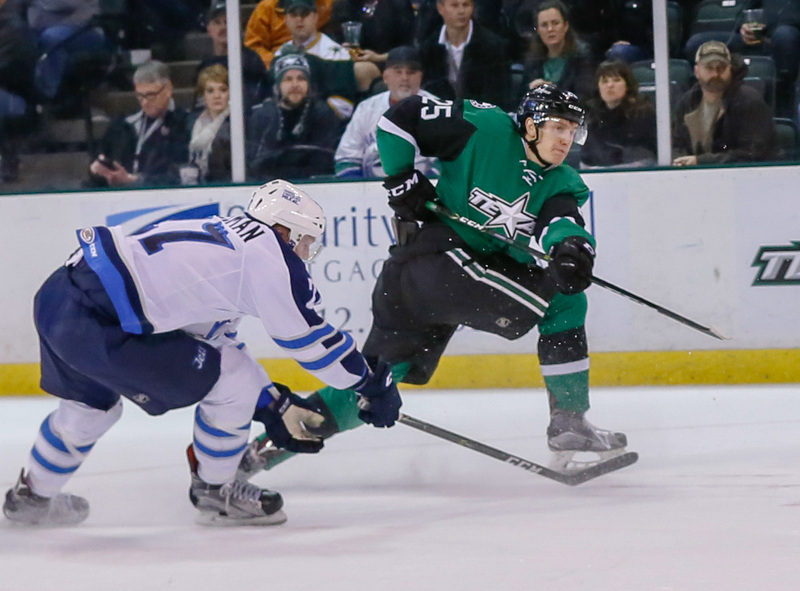 The Stars still have a mountain to climb to get into playoff contention. Despite being 5 games over .500, they trail Stockton and San Diego for the 4th spot in the division. Texas will need to extend their winning streak by four more games, including tonight, in order to get above .600, which is the current mark for 4th place. 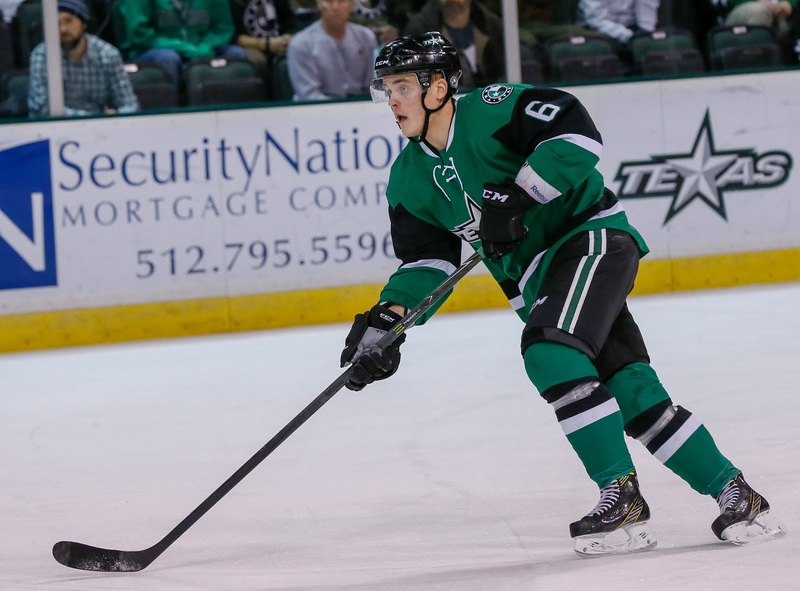 UPDATE: Julius Honka has been recalled to Dallas. The Stars make their first and only visit to the Iowa Wild this weekend for a pair of games. 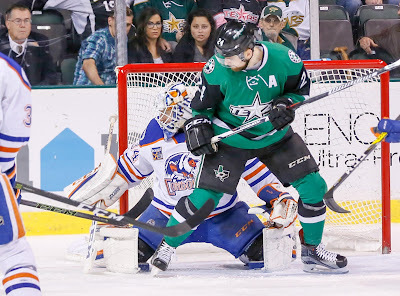 The Stars will come in with a win their last contest but a record of 4-5-0-1 in their last ten. The Wild are a game below .500 on the year and find themselves on a two-game losing streak among a four game homestand. Unfortunately for the Wild, they had excellent momentum coming into the homestand, winning two in Manitoba and two in San Antonio. It was their longest win streak of the season and took them all the way to .500 from four below. You better believe the Wild will seek to put a body on Denis Gurianov, who has the Stars' last two game-winning goals. The young Russian is coming into his own in the league. 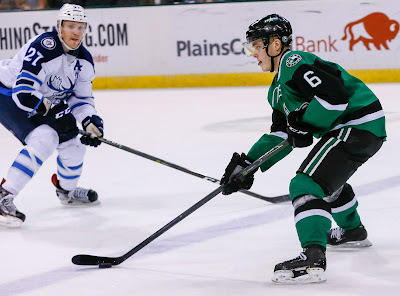 On the Wild side, Teemu Pulkkinen is one that the Stars much watch. He is 12-14=26 with 31 GP and was always lethal against the Stars as a Griffin. Former Star Maxime Fortunus has played 30 games this season going 1-3=4 but with a plus-6 rating, the best on the team. The Texas Stars used an energetic close to the second period to vault themselves past the Manitoba Moose at home tonight by a 3-2 margin. Rookie forward Denis Gurianov had a goal and an assist, contributing all over the ice as the coaching staff has elevated his role and added him to the power play. Gurianov scored the game-winner with yet another five-hole goal, almost his signature move at this point. "It's just lucky," said Gurianov. "I wanted to score in the five hole because [I had] big speed." Coach Laxdal expanded on Gurianov's new role, "We've elevated him in the lineup to get him more ice time. The goals [in the past two games] were great goals by him in key moments. It's nice from a coaching standpoint to see him grow his game." Gurianov started the year in a top 9 role but is clearly cementing himself into a top 6 position. Laxdal even noted that he will be moving Gurianov onto the Stars penalty kill to take advantage of his speed. Manitoba opened the scoring with an unfortunate mistake by Matej Stransky. On the power play, Stransky whiffed on a breakout pass, putting the puck directly on the stick of Quinton Howden. The former Rampage forward beat Bow on the blocker side for the 1-0 lead. The Stars would answer with a power play tally from Gemel Smith, a tip play for the 1-1 tie. 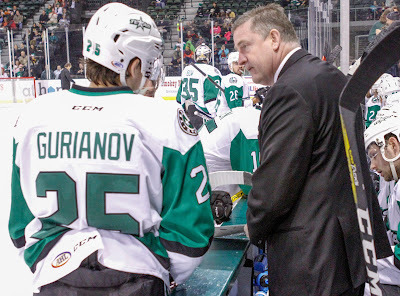 Gurianov had the second assist. Down 2-1 in the second after a Moose power play goal, the Stars poured on the shots and spent extended periods in the Moose zone, generating dangerous chances. "The first 30 minutes we were a little tired and lethargic from the road trip," said Coach Laxdal. "The last 30 minutes we picked it up and played the way we were capable of." Julius Honka got things going on the comeback with the tying goal from the point late in the second. The Stars gained the zone and had the Moose all out of sorts, chasing the puck as it whizzed from stick to stick. When Honka got it at the point with no one within 15 feet of him, the tally was good as counted. "I think [the game] just started out a bit choppy, no flow and pucks bouncing around," said Jason Dickinson. "It took a bit to find our legs with such tough road travel. We had to create some energy." The second period closed with the Stars driving the net repeatedly and generating good momentum for a lively third period. Texas was rewarded for their efforts with an early goal by Dickinson. The sophomore forward lofted one over Eric Comrie off the pass from Caleb Herbert behind the net. "It was a great forecheck. Herbert made a nice play, took a look over his shoulder and saw me. I was lucky enough to be able to put it home." Gurianov would notch his game-winner unassisted in the third. Postgame, he noted that he feels much more confident after his stint at World Juniors, "I feel better, a little bit better. I played a lot in World Juniors and I [am playing] a lot now in Texas." Laxdal continued, "He's a first round pick with great wheels. Early in the season, he had good looks but wasn't scoring. Now he's burying those chances." With a 6-on-5 advantage, Manitoba would come within one goal at 4-3. However, Landon Bow and the Stars would lock it down. Bow had 24 saves on 27 shots. The Stars home stand was shortlived, however. Texas now hits the road for a pair in Des Moines Friday and Saturday night. 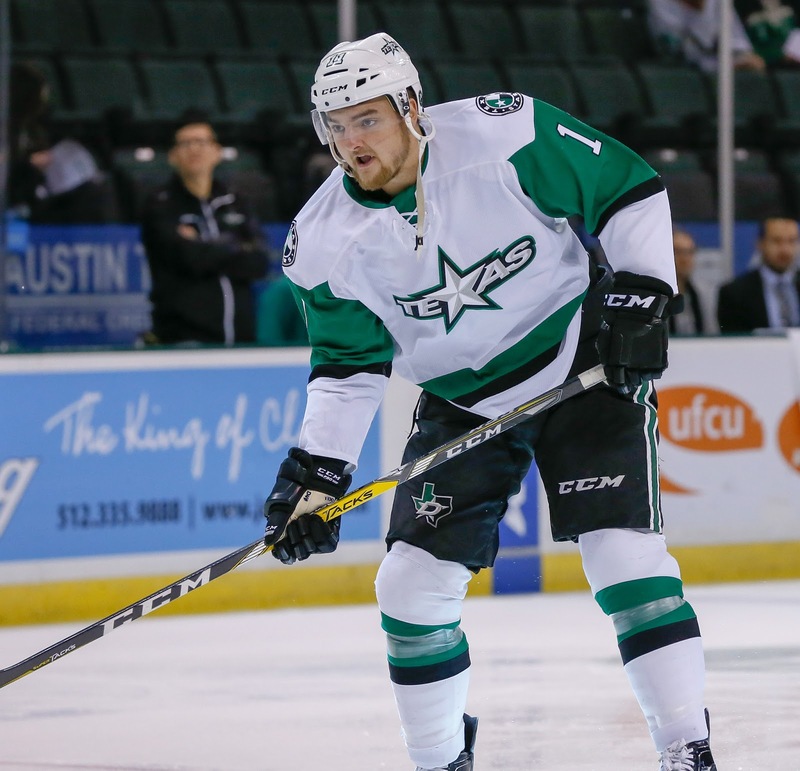 Justin Dowling will not make the road trip but the Stars do not anticipate it to be a long-term issue. Texas got a gargantuan goal effort out of Brandon DeFazio but couldn't keep the goals against away. The forward's power play hat trick was wasted in a 5-3 loss in Tucson this evening. Texas never led in a game that was filled with special teams. In all, the teams combined for five power play goals on 12 chances. You can't fault Texas' power play effort at 3/8, all coming from DeFazio. 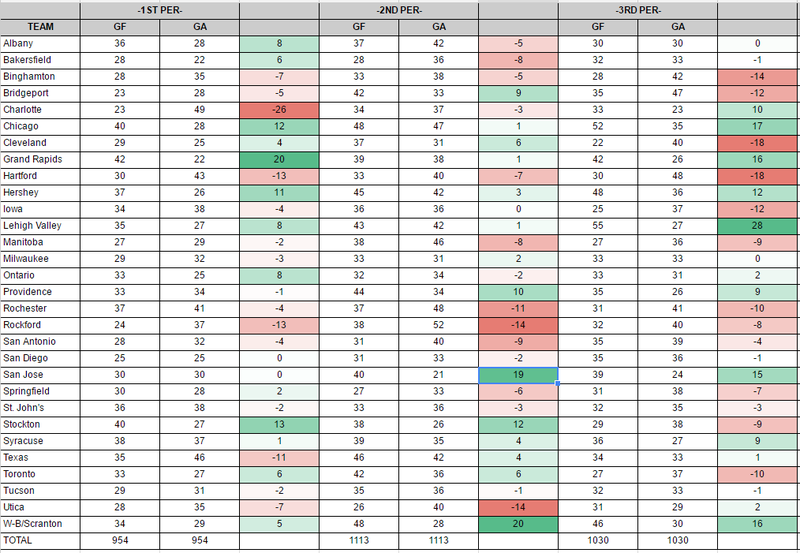 However, their penalty kill, mired at last in the league, gave up two in the loss, ultimately the difference. A late empty net goal sealed the game as Texas tried for the tying tally. 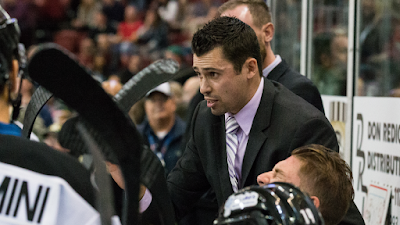 The Stars kept the shots below 30, a stated goal for Coach Laxdal. However, the goaltending was not as tight, with Maxime Lagace allowing four goals on just 27 shots (.852 SV%). Texas put 40 on Adin Hill in the Roadrunners net. These two teams meet again in Tucson tomorrow night as Texas continues its four-game road trip. While it's not quite as high flying as they were to start the season (0.800 pts %), the Roadrunners are doing alright. While they might be in 4th place, their .621 points percentage has them in a pretty spot. Their next closest competitor for the final playoff slot in the Pacific Division has a .561, and that's tonight's opponent, the Texas Stars. Texas comes in with a big win over division-leading Ontario. The Roadrunners are in the midst of a five-game homestand that will see them play those same Reign before they depart for a rare trip to North Carolina. Their opening game was a convincing 5-2 win over the Manitoba Moose. For the Roadrunners, watch out for their top scorers. Some are familiar. Some are not. Of course, Chris Mueller is among them (7-23=30 in 29 GP). However, his veteran play is matched by a rookie, Kyle Wood (8-22=30 in 29 GP). Both are top twenty in the league in scoring. The Roadrunners are without Brendan Perlini, who still ranks top five in team scoring (14-5=19 in 17 GP), despite lacing them up for the club just once since December 3rd. In fact, Perlini was assigned for the game against the Moose and scored a hat trick. He was quickly recaled. 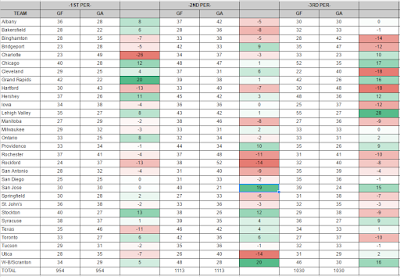 For Texas, watch for the goalie matchups as always. Maxime Lagace has now started three in a row. However, with 8 games in 14 days and 3 in this 4 day stretch, Bow would seemingly have to come in at some point. 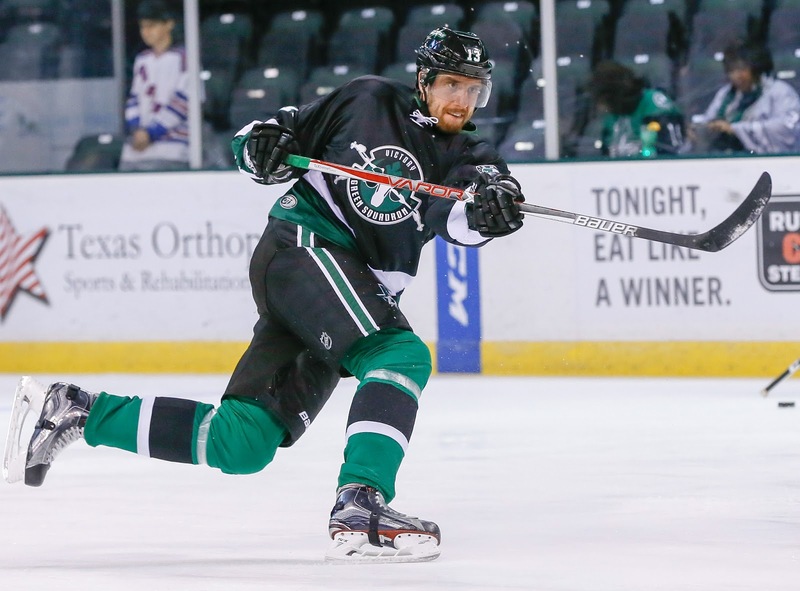 Rookie forward Mike McMurtry has been assigned to the Idaho Steelheads of the ECHL. 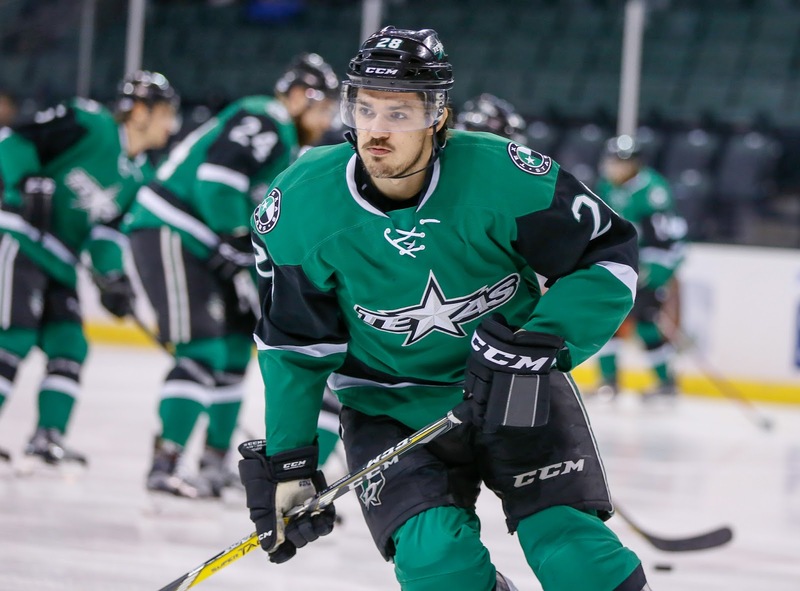 The Stars are returning to health all across the lineup, and McMurtry was a scratch for both games this weekend. Since coming out of Northeastern last season, McMurtry has only played in the AHL. He signed an ATO last season and a standard contract for this year. This is McMurtry's first ECHL assignment. 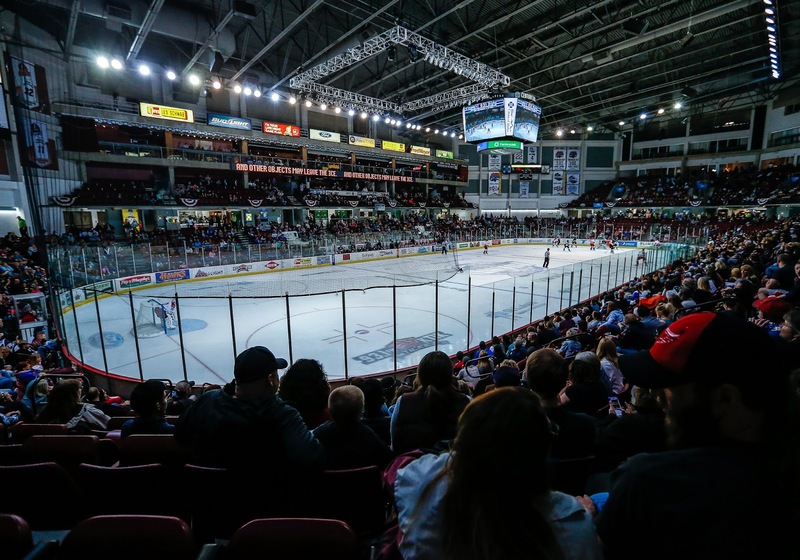 The Steelheads play three games this week, all at home against the Colorado Eagles. The Texas Stars, American Hockey League affiliate of the NHL's Dallas Stars, announced Monday the team has assigned rookie forward Mike McMurtry to their ECHL affiliate, the Idaho Steelheads. McMurtry, 24, has tallied 10 points in 26 games this season with Texas (5-5=10). The 6-foot, 180-pound forward is currently in his rookie season after finishing up a four-year career at Northeastern University last year. The Greely, Ontario native recorded 80 points (20-60=80) in 141 collegiate games before beginning his professional career with the Stars. 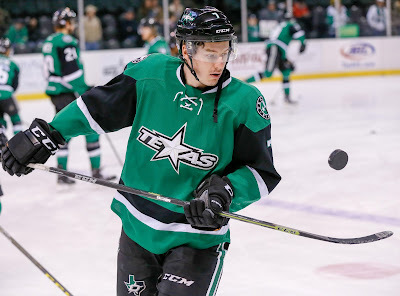 Texas played another tight, grinding game this evening against the Cleveland Monsters, coming out on the wrong side of the final score but with a lot of positives to count. 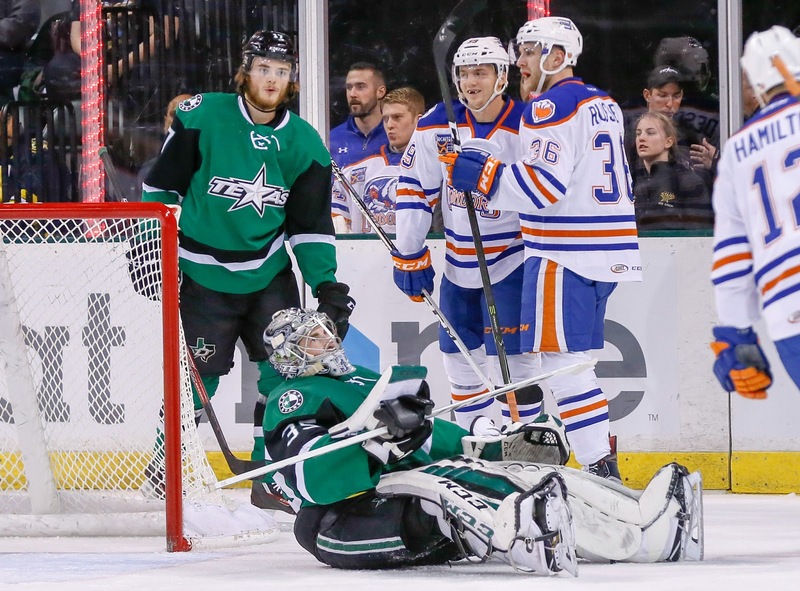 The Stars earned a point in the shootout loss and got several parts of their game back on track in the process. "It's good for our group to play in a game like this and grind out a game," said Coach Laxdal. "We did a good job to get a point and 3 of 4 on the weekend, especially coming off the three game losing streak." After a week of practice and with the knowledge that Cleveland had one of the best records in the league over the past few weeks, Texas was in for a challenge. Last night's Stars' win was bound to generate a response from the Monsters. However, it was Texas kickstarting the scoring early with the fourth line chipping in. "The fourth line was our best line tonight. If you look at work and zone chances and just on the puck, they were on the puck all night. They did a good job with the minutes they were given tonight." 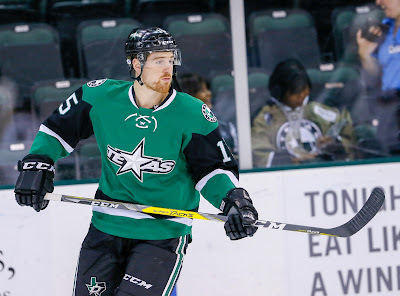 The fourth line goal from Caleb Herbert came from within a few feet of the net, a backhander simply seeking to put a puck on net, beat Anton Forsberg for the 1-0 score. "We just try to create energy and get to the net," said Herbert. "We were just trying to build each shift and play in the offensive zone, not the defensive zone." As the game went on, Herbert, Ethan Werek and Austin Fyten saw more minutes. In the third period, as Texas was coming up empty with repeated power play chances, they were even put in for the man advantage. The line had one of the best chances of that sequence. 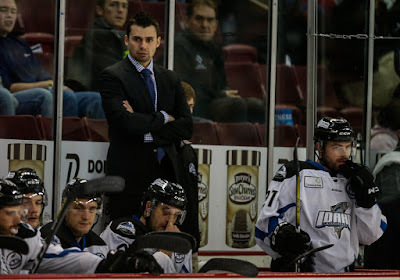 Coach Laxdal contrasted the play of the fourth line with the power play units and some of the play of the top nine: "When we're not scoring goals the right way, you tend to get bad habits: make extra passes and be too cute. The easiest way is to put pucks on net and that's why our fourth line was so successful. Pucks to the net, go to the hard areas and get rewarded." Despite the power play's struggles, the Stars did lock down the Monsters power play with a 4/4 effort on the PK. Nick Moutrey scored in the second period to tie things at one, a mark that would stand through regulation and overtime. Maxime Lagace was a big reason for that. He earned the back-to-back starts with his performance last night and stopped 28 of 29 tonight through 65 minutes. "Lagace gave us the chance to win. His game was good and he got us 3 out of 4 points. We're going to need him down the stretch." The shootout would be unkind to the Stars as Caleb Herbert scored in Round 3 only to be matched by Jordan Maletta's tally. Travis Morin hit the post on his Round 4 bid, and Alex Broadhurst sealed the deal for the Monsters. Texas hits the road for three out West, starting in Ontario on Wednesday. The Dallas Stars have assigned Patrik Nemeth to the Texas Stars on a conditioning assignment. He is expected to be available for tonight's game against Cleveland. With eight defensemen in Dallas, there are two scratches each game. 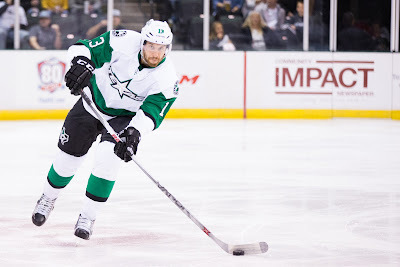 Patrik Nemeth's last game in Dallas was on December 23 and before that December 8. 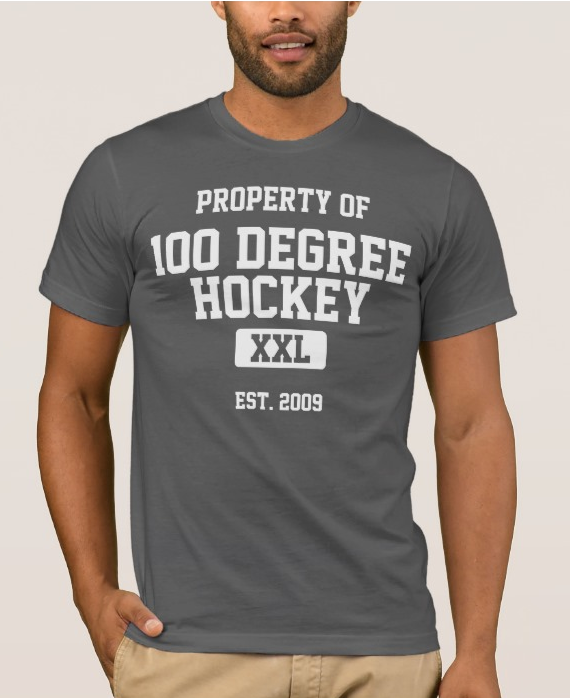 This is a move to get Nemeth some ice time. 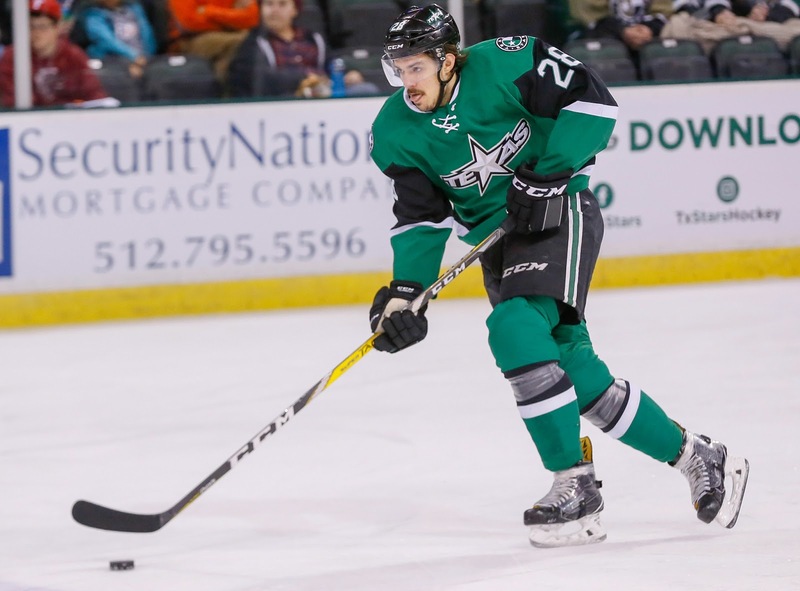 Nemeth came to Texas on a conditioning assignment last year and Stephen Johns came down on one earlier this year. Conditioning assignments cannot last longer than 14 days by rule. The next 14 days for Texas includes 8 games, which is a pretty packed portion of the schedule.